Seychelles is an archipelago located at Indian Ocean. Seychelles has 491 kilometers of coastline. Natural resources of Seychelles include cinnamon trees, copra and fish. The population of Seychelles as per the census of 2007 July was 81,895. The people residing at Seychelles are known as Seychellois. The Seychelles political map exhibits the location, boundaries, national capital, major towns with specific symbols. Seychelles was visited by explorers as early as AD 200, who arrived from Borneo, and later by Arab merchants who traded in the region around AD 850. However, the island remained uninhabited for many centuries. English tradesmen stopped on the island in 1609, finding it populated only by animals. Later, when nearby Madagascar and Mauritius were settled, there was an increase in activity throughout the region. The French made their way from their colony on Mauritius during the Seven Years' War, claiming the island for France in 1756. Though the island was primarily used for its natural resources, it was along the trade route to India, and used to cultivate spices. After the French Revolution, the settlement on Seychelles began to separate themselves from Mauritius, under the leadership of Jean-Baptiste Queau de Quincy in 1794. The British fought for control of the island, but Quincy remained in power until 1810. Along with Mauritius, Seychelles was made a crown colony under British control. The British conflicted with the colony on the issue of slavery, which the colonists relied upon for their labor, but the British leadership had abolished. Seychelles became a separate crown colony from Mauritius in 1903. World War I was difficult for Seychelles, which had trouble importing necessary goods, and the colonists began to seek separation from Britain. 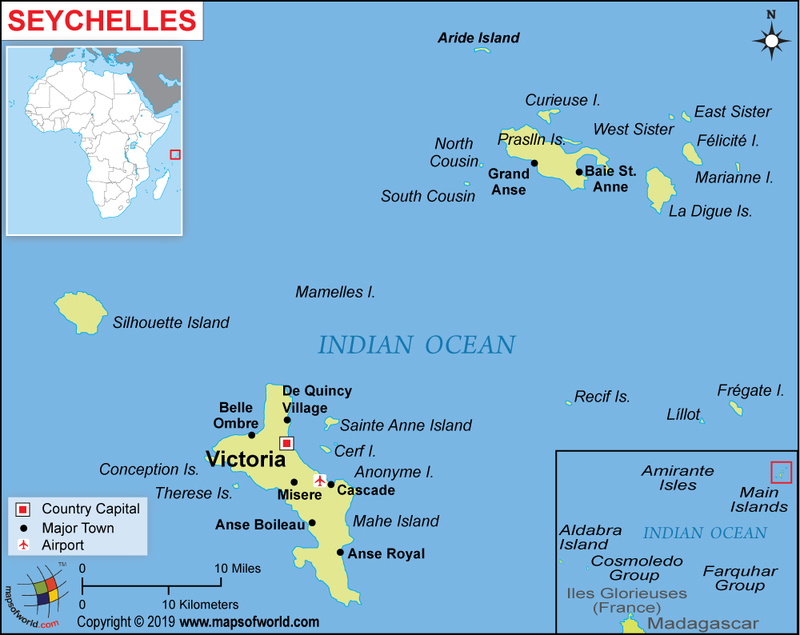 Seychelles gained independence in 1976, becoming a republic within the Commonwealth. Madagascar, Zanzibar, Mauritius, Comoros, Reunion, and Rodrigues are some of the nearest islands to Seychelles. Seychelles is an island nation in the Indian Ocean, off the southeastern coast of Africa. The archipelago of Seychelles is made up of about 115 islands in total. There are 42 main islands, the largest of which are Mahe, Praslin, Silhouette Island, La Digue, Curieuse, Felicite, and Fregate. These islands are called granitic, meaning they are made of granite rock, and are the only one's of this kind found on Earth. There are also many coral islands within Seychelles, grouped into the Amirantes, Farguhar, and Aldabra island groups. The coral islands are mostly flat, without fresh water, and as such are not inhabited by many people. The highest point in the archipelago is Morne Seychellois, which stands 905 meters (2,969 feet) above sea level, and is located on Mahe. The main rivers on the island are fairly short, and include Point Conan, Rochon, Cascade, Bougainville, and Barbarons Rivers. The beaches of Seychelles are some of its greatest attractions, with sandy shores, warm waters, and beautiful scenery. With the remote destination of Seychelles, the beaches remain in their natural state and are often uncrowded. There are many water sports available on the islands, including sailing, scuba diving, and fishing. There are places to take a glass-bottomed boat tour, and view the sea life in a unique way. Praslin National Park's Vallee de Mai Nature Reserve, is a UNESCO World Heritage Site and home to a palm forest, including the endemic Coco de Mer, with the largest seeds in the world. The park is also home to a variety of native species, including the black parrot, tiger chameleon, and varieties of geckos. More wildlife can be viewed at Aldabra Atoll, which is home to giant land tortoises, tiger sharks, and manta rays. This coral atoll is the world's largest. The capital, Victoria, features the Natural History Museum, and architecture including a clock tower, markets, and an inner harbor. Mahe also has resorts, casinos, and nightlife. The international airport in Seychelles is near the capital, Victory, and is called Seychelles International. The airport offers service to South Africa, Ethiopia, Kenya, Emirates, Qatar, and nearby Mauritius, among a few other destinations. The only other option for transportation into Seychelles is boat, but this is a very limited option. Between the islands, there are flights between Mahe and Praslin, or Mahe and several smaller islands, like Bird and Fregate. Helicopters and boats can be chartered for these short trips as well. Ferries run fairly frequently between Mahe and Praslin, which is a less expensive option than flights. Roads on Mahe and Praslin are narrow and winding, but cars are an essential method of travel on the island, allowing visitors to see the whole island. There are also taxis, but this can be a more expensive option than renting a car. Buses are another option, with frequent service around the island. Bicycles can be a good way to explore the islands. The Seychelles Flag was officially acquired on 18 th June in the year of 1996. The proportion of Seychelles National Flag is described as 1:2. Major ReligionReligion in Seychelles. The 2002 government census estimated that 82 percent of the population of Seychelles are Roman Catholic and 6 percent is Anglican.